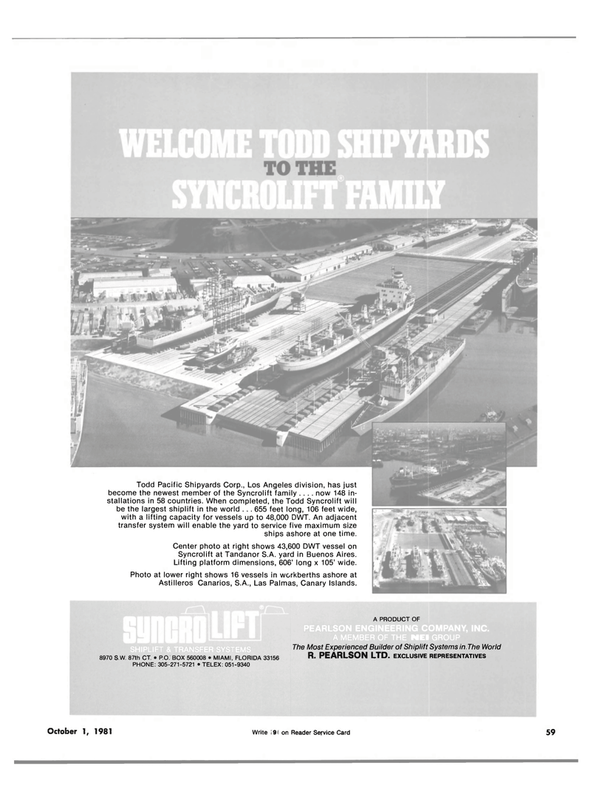 Todd Pacific Shipyards Corp., Los Angeles division, has just become the newest member of the Syncrolift family .... now 148 in- stallations in 58 countries. When completed, the Todd Syncrolift will be the largest shiplift in the world . . . 655 feet long, 106 feet wide, with a lifting capacity for vessels up to 48,000 DWT. An adjacent transfer system will enable the yard to service five maximum size ships ashore at one time. Syncrolift at Tandanor S.A. yard in Buenos Aires. Lifting platform dimensions, 606' long x 105' wide. Astilleros Canarios, S.A., Las Palmas, Canary Islands.